The IONode™ flight data recorder offers a fully-automated solution for data gathering, distribution, and real-time flight alerting. Highly configurable reporting parameters are purpose-built for your aircraft to support flight operations and maintenance quality assurance. Enable programs to maximize fuel management, flight data monitoring, or special mission operations such as bucket drop tracking for aerial firefighting. Transform your data into actionable analytics with Latitude’s IONode. The IONode is a lightweight flight data recorder that improves aircraft operating efficiencies, reduces maintenance costs, increases safety, and grows your fleet’s bottom line. 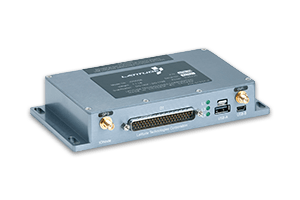 Adaptable to all FDR and QAR requirements, the versatile data acquisition unit features highly configurable recording and reporting parameters backed by Latitude’s proprietary SAFR flight data and communications standards. Operational goals, initiatives, and fleet-specific programs are able to be uniquely adapted with the IONode’s discrete and analog input configuration. Enable fuel management programs, flight data monitoring, special mission operations, training, and more through manipulation and review of your aircraft data. The IONode is the ideal data collection system for developing a complete FOQA and FDM program with measurements for success. Featuring a large internal storage, three methods of offload and a wide range of external inputs and internal sensors, the IONode can enable high-quality FOQA programs for a range of aircraft types. Digital and analog inputs can be configured to decode custom ARINC 429 and 717 messages for review and analysis of program efficiency. Latitude provides excellent data capture on fully analog aircraft, as well as aircraft with digital data busses. WiFi offloading allows for regular data transmission to Latitude’s servers without pilot or mechanic action. The versatility of the IONode to adapt to meet your program requirements is invaluable. Special mission operations such as aerial firefighting can be configured to record key parameters, providing your operation with the necessary tools to help fulfill contractual requirements for government agencies. Integrating with any bucket or tank system, operators can monitor, track, and report on parameters such as bucket fill and drop status, location, and more. The fully-automated IONode can also feed into Latitude’s Flight Data Analytics to provide a visual and graphical representation of your data. Seamlessly transforming your recorded data into trending and performance analytics for assessment and review of program efficiencies and goals.